A few months ago I cut the cord on cable TV. I still use the cable company for internet, but I traded the cable television for subscriptions to Netflix, Sling, and Hulu. For local TV stations I recently installed a HD antenna in the attic and I have the signal running to six outlets in the house from the single antenna. Essentially the HD antenna replaced the cable company feed to the TVs. Crystal clear reception of all the major networks. Nice! Coaxial cable long enough to go from your mount point to the entry point of the cable/satellite feed on the side of the house. Note: The details of your house will vary slightly. I include in these steps decision points so that you can make sure your installation is working before making a final installation. Check the distance of your home to nearest HD transmitters. I used http://www.antennapoint.com/. This is important because it will determine if you need an antenna rated for long distances. While on the site, also note the direction of the HD transmitters from your house because you’ll want to point your antenna in that direction. 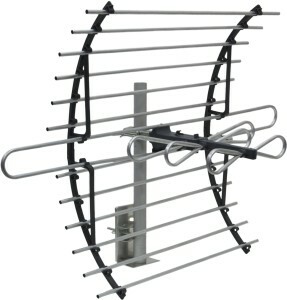 Buy a HD Antenna that is designed for mounting in the attic or outside. If you are beyond 50 miles from the nearest transmitters make sure to find an antenna with extended distance strength. If you are less than 50 miles then standard antennas should work as long as you have a good mount point. But research the specs and customer reviews for this point. I purchased this attic mount antenna from GE. I’m about 25 miles from the station transmitters in my area. 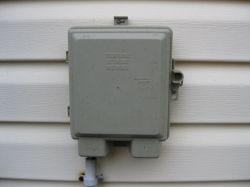 Buy a coaxial cable (This is the same type of cable that runs from the wall to the back of your cable/satellite box) that is long enough to reach from where you intend to mount the antenna to the location where the cable/satellite enters the house. This is usually on the side of the house. I purchased a 100 foot cable because my entry point was in the basement. I probably only needed about 65-70 feet, but I didn’t want to be short and I thought the extra length could be used if I have to move the mount location in the future. Setup the Antenna on a single TV first to make sure it has the strength for reception and works. I chose to test on a television in an upstairs bedroom because it was the highest point inside the house. Choose a location for mounting the antenna. The higher you mount an antenna the better as it will increase the chances of avoiding trees or other objects that could degrade the signal quality. Remember, you’ll want to aim the antenna in the direction of the transmitter stations for best quality. Mount the antenna in the attic or outside. If possible run the long coaxial cord you purchased to a single TV as a temporary test of the mount location. 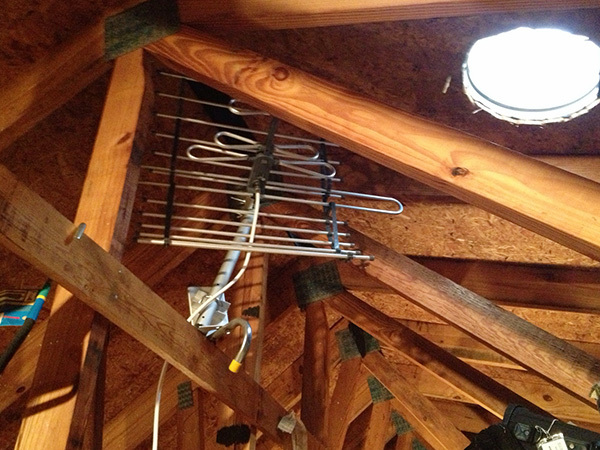 Since I was in the attic, I ran the cable through the attic ladder opening to an upstairs TV for the test. 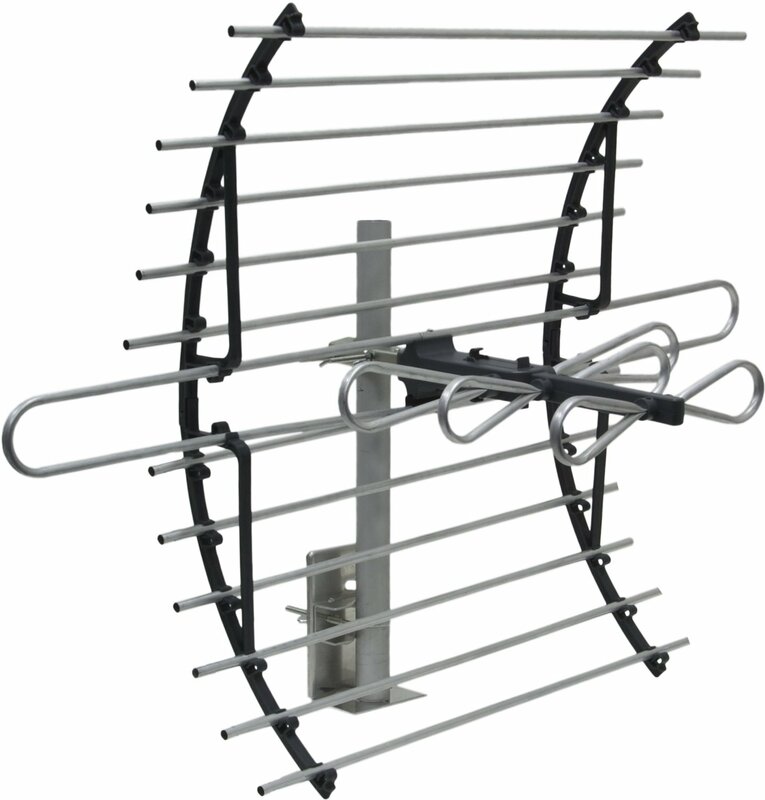 This will allow you to adjust the antenna positioning if needed for more optimal reception. Run the coaxial cable from the antenna to the place where the cable/satellite line enters the house. Depending on your house and mount point, this could be the most difficult step of the process. Since I was in the attic I used a drill bit to make a small hole in the soffit very close to the downspout on the corner of the house. I then pushed the coaxial cable through the soffit hole into the attic so that I could grab it from the inside and secure it. Inside the attic I secured the cable along the wood beams for protection. I then used the downspout to hide the cable from visibility in the front of the house. Secure the other end of the coaxial cable to the place where the old cable line/satellite line entered the house and terminated. It will look something like this. There is probably a splitter of some kind as the main feed from the cable company splits to lines running to each outlet. This is the picture of what it may look like. If you use the cable company for your cable modem then you you’ll want to split it out separately from the TV feeds. 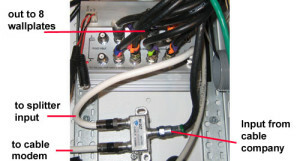 Reference the picture above and replace the feed going to the splitter with the new cable that is connected to your antenna. The connection from the antenna should go to the splitter that has all the other cables going to the outlets in the house. Once you have made this connection then go to each TV in the house and make sure the cable line is connected from the outlet to the TV. You will want to go to the menu of your TV set and the antenna section to let it scan for stations. Enjoy crystal clear HDTV! Power/signal booster. 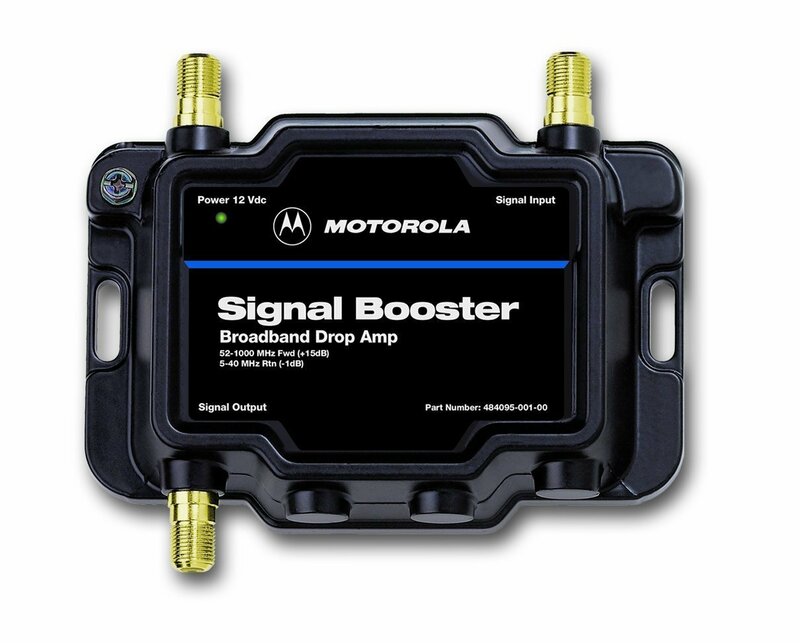 Depending on the length of your cable coaxial runs and the number of splits at the splitter, you may need a signal booster. If you notice blurring or digital pixilation you can try to strengthen the signal. 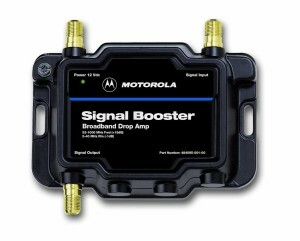 I used this Motorola signal booster. Install the signal booster between the antenna input and the coaxial splitter going to all the outlets in the house. HD converter box. Much like the cable/satellite set top box you can buy a HD converter box for the antenna signal. This device will show you information about the current content on the TV such as name of show. Most of the devices available for purchase also allow you to insert a USB data stick to act as a digital video recorder. I ordered one of these digital TV from ViewTV to go with the main TV in home theater. The other TVs have a direct connection to the back of the TV from the wall outlet. I recently wrote about online options to traditional TV. This week Disney announced plans to buy a 30% stake in Hulu. You’ll soon be able to view programs from the Disney family of networks on Hulu. Big networks are preparing for the eventual wave of online viewers. NBC, Fox, and Disney now all have a stake in Hulu. You can expect to see their marketing departments experiment with content delivery and advertising programs as the online viewership of Hulu grows. In my last post I compared the marketing focus and features of Netflix and Blockbuster mail order DVD programs. Traditionally these have been thought of as complementary programming to standard cable or satellite TV. However, with added features such as television network programming, they may become substitute products for cable and satellite in the future. Another group of alternatives is online streaming video and programming from companies such as Hulu and Joost. Joost provides television, movie, and music programming through online streaming. The content is free of charge to the consumer as ads from sponsors pay for the service. The Joost web site is a a full-on social media site with recommended content, reviews from others, sharing links, popular content, etc. There is even an iPhone app to stream the content. What surprised me was that the television programming was up-to-date. I picked CSI: NY at random from a list of dramas. The first episode originally aired on March 25, 2009 on the network and was posted online for viewing just a few days later. The film selection on Joost did not appear so fresh. Not bad if you like classics or want to catch up some films you never knew existed. All-in-all, the site is mainly focused as a navigation of content tool. Information about how they manage their programming, a knowledge base, a blog, and other program type materials are in the footer of the application away from primary eye-sight. Hulu contains television programming and video content without the music section offered by Joost. As with Joost the selection of films is very dated or unpopular, while the television programming is recent. The site also has a blog to keep subscribers informed of new content. Hulu is a catalog based sited. It’s purpose to to create a catalog of online content so that users may navigate and watch. So are these online and mail order content providers ready to replace your cable/satellite programming? I think that depends what type of programming you watch. If you watch alot of current programming such as sports or news then this option is not for you yet. But if you watch alot of TV series and an occasional movie then these options could be your way to unhook that cable/satellite box.